Molinard, the mythical perfumer-creator from Grasse on the Riviera since 1849, now waits for you at 72, rue Bonaparte. The perfumes are conceived among the flowers, the visitor is immediately immersed in this dreamlike universe. On the purple walls, minimalist shelves in intricate shapes sublime the exclusive collections of the rare and exceptional perfumes. Emotional admiration in front of the iconic “Habanita” with 680 essences that revolutionized French perfumery by introducing the vetiver in the first oriental perfume for women. That was in 1921. The visit can be further enriched by creating your own, made-to-measure perfume at a workshop. An introductory sensory experience where, in front of a revolving perfume organ, we made up the elixir of dreams by selecting the base notes, heart and head. 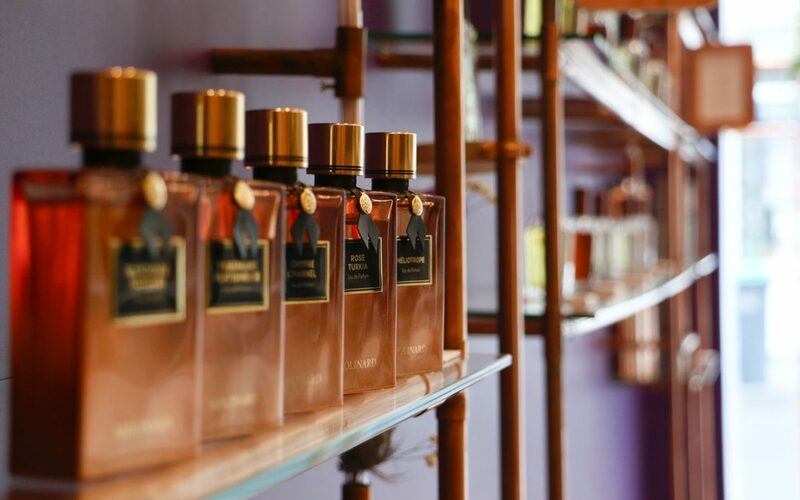 The formula “La Villa du Parfumeur” lets you walk away with your personalised bottle consisting of 100 essences, after a champagne and mini-pastry tasting. The ultimate luxury!